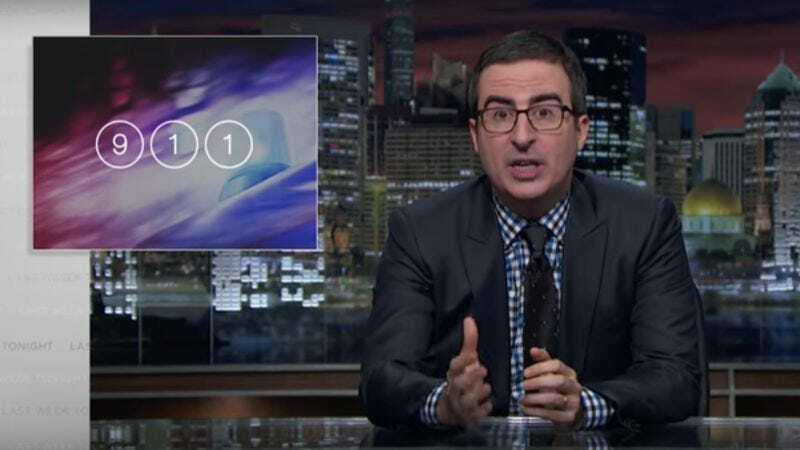 It’s been a national concern since Public Enemy pulled it into the spotlight back in 1990, but the national emergency hotline number 911 got some new press last night, as Last Week Tonight With John Oliver dedicated almost half its running time to the subject. It seems the hotline service is a joke in some areas, largely thanks to being underfunded and understaffed. As we see, the lack of money is a real issue as far as updating the technology, which currently lags behind even the most basic pizza-delivery app when it comes to finding your location based on tracking your cell phone. And the lack of staffing means numerous calls aren’t getting taken, with people in emergency situations finding themselves confronting a recorded message asking them to hold—not what you want to hear in a burning building. Oliver calls out the problems, and points to the way many state governments are diverting funds meant to go to 911 for other purposes, something it should be obvious is a bad move, like making reservations at T.G.I. Fridays.